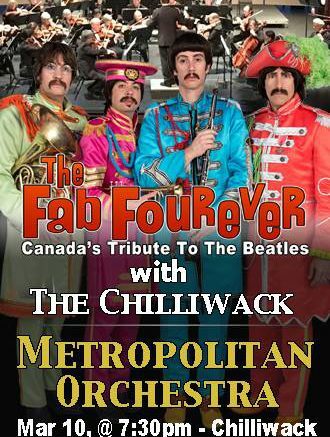 Chilliwack – In 2012, the Fab Fourever, one of the most acclaimed Beatle tribute bands (and based out of the Fraser Valley) and the Chilliwack Metropolitan Orchestra, combined forces and created a memorable night of music. A number of the songs were never performed live by the Beatles in their heyday. They couldn’t. The technology wasn’t there to pull it off. In 2012, they first recreated the “what could have been”concert and they pulled it off. They’re going to do it again on March 10 and 14th, 2018, with two concerts- Chilliwack and Mission. Ticket information here. Tickets are now available for the Fab Forever live on stage with the Chilliwack Metropolitan Orchestra. Be the first to comment on "Fab Fourever And Chilliwack Metropolitan Orchestra – Together Again – Saturday March 10 (VIDEO)"